The boarding houses provide a comfortable home away from home. Here the student can unwind or study or chat about latest trends. The emphasis is here on collective enjoyment. It has all the facilities that help the children to live and grow in an environment that they can identify as their home. It also recognizes the uniqueness of each individual and enables its members to synergize in a manner that enriches residential community life. The Hostel is designed to provide every facility for study, leisure and enjoyment, which can add so much to the school days and later-life. There are air-conditioned rooms in separate wings for boys & girls. Each room is shared by 2, 3 or 4 students depending upon size of the room and the class of students. A High Definition TV is provided for both boys and girls separately. There are separate Computer labs equipped with high speed internet connection with latest configuration, printers and scanners. 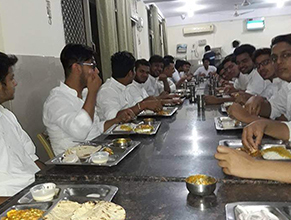 Each wing of the hostel has resident staff that looks after the welfare of the students and makes sure that everything runs smoothly. With regard to security, it is world class, with fire sprinklers/ fire alarms, smoke detectors at regular intervals. Students have access to a book shop, a tailor shop and canteen. The Dining hall also has a Fitness Corner. A dedicated and trained team of cooks, supporting staff and Assistant Wardens make sure that hygienic food with variety is provided to all at proper timings. 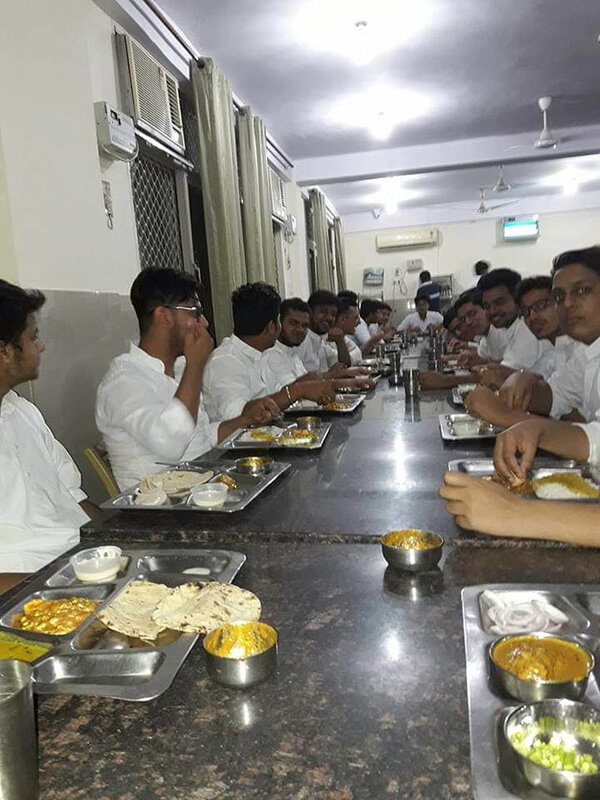 We provide vegetarian as well as non-vegetarian items as per menu decided by Hostel committee consisting of Hostel superintendent, Hostel Wardens and student’srepresentatives from both girls and boys. Parents seeking hostel accommodation in the school are required to submit a written application to the Principal if the principal grants admission the parents must deposit the hostel fee with the hotel accounts clerk after obtaining the hostel fee receipt parents are to report to the hostel superintendent for the completion of hostel admission formalities. 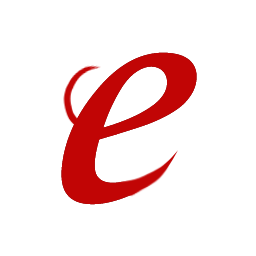 They are to submit the requisite details indicated in the succeeding paragraph. After all the formalities have been completed the hostel warden is informed accordingly and the child is allotted a room etc. A personal file of each child is maintained by the Hostel Superintendent /Warden. 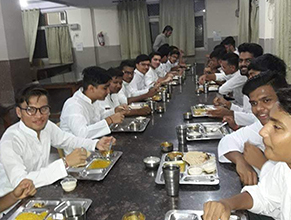 It is compulsory for all hotel students to obtain a health insurance cover The Proforma duly completed must be handed over to the Hostel Superintendent and placed in the personal file of the student. A certificate certifying that no cash /costly belongings are in the student s possession. A list of articles of clothing and other items to be deposited with the student, a copy of which is to be handed over to the Superintendent/Warden. Indemnifying the school against any damage, sickness accident or death caused in the normal fractioning of usual activates. An authority letter from the parent indicating two names and addresses (with 2 photographs, ID proof, address proof, telephone numbers and e-mail ID) who would act as the local guardian. Kindly note that only those persons will be allowed to become local guardians who are employed and living in family environment. In case at any point of time if it is observed that Local Guardians are non-cooperative/inactive; the admission of the boarders will be cancelled and no refund of fee will be given. 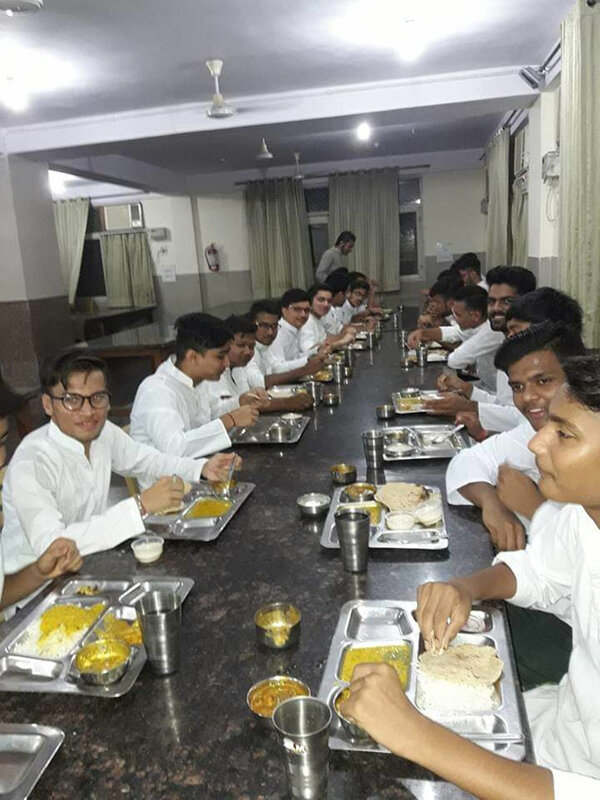 All Boarders should follow the daily routine of the hostel and school as per hostel rules and schedule given in the hostel rules and the time table of the school respectively. No hosteller is allowed to keep more than Rs. 200/in cash in the possession and no valuable things should be possessed by them while staying in hostel. No hosteller is allowed to keep any type of medicine in his possession without it being prescribed by the Medical Officer of the school. Keeping eatables in the rooms is unhygienic and is strictly prohibited. Please note that the computer games, mobile, tabs, laptops, electric iron, heater, teakettle, any other electronic items including Walkman’s etc. are NOT PERMITTED. Attendance /Night roll call will be taken by the respective Wardens at 10.30 p.m. in summer and at 10.00 p.m. in winter. The reports of the hostellers of their school examination will be sent to their parents through the hostel warden at their respective addresses provided at the time of admission in the hostel. All the hostellers have to inform their respective wardens regarding any change in their parental/native address if any. No hostellers are allowed to invite day scholar colleagues to the hostel premises for their personal interaction or any other reasons. All the hostellers when sick will report to the clinic of the school through the hostel warden immediately and are not supposed to take medicine or their own or on advice of their co-hostellers. All the hostellers should deposit their fees to the Account Department as per the stipulated schedule given to them. No hostellers will be given admission for the next year if he/she fails in the final examination of his class. No hostel facility will be provided to the hosteller if he /she secure compartment in any subject until he/she clears his/her compartment in the subject. No hosteller will be provided any leave or break during the schedule period of the school mentioned in the hostel rules under the leaves rules. No hosteller will be allowed to remain in hostel during his/her illness other than emergencies.If a hosteller is treated outside the school premises for any disease, he/she will be allowed to join the hostel only on submission of medical fitness certificate countersigned by the school medical officer. No hosteller will organize any kind of any kind of meeting in the hostel premises. No hosteller will neither indulge himself/herself alone or along with other hostellers in any kind of undesirable activity during the hostel hours or in the school nor co-operate with day scholars. No hostellers should ever instigate the other students into any sort of indiscipline or any sort of act which will hamper the other students physically or mentally. No hosteller should indulge with co-hostellers or day scholars in any kind of ragging or bullying. All hostellers should respect each other's belongings. No hostellers should damage any article of the school hostel or school. School Management will not be responsible any loss of their valuable articles personal as boarders are not allowed to keep any valuable articles in their possession during their stay in hostel. Entire school campus and hostel is ‘Tobacco Free Zone’. Consumptionof alcoholor gutka or any kind of pan masala or chewing of tobacco is totally banned. No hosteller is allowed to keep playing cards in his/her possession or gamble which will be strictly punished by school authorities. No hostellers will discriminate any other hosteller on the caste/race/religion/region. All the hostellers must respect all the religions and rituals co-hostellers. No hostellers should place any order with e-commerce site without written permission from the authorities. All the hosteller should take care of our environment and help in keeping it green. No hostellers should possess any kind of sharp articles like knives, kirpan, sword etc. No hostellers are allowed to keep any kind of magazine book in their possession except provided/allowed by their respective warden. No hosteller should use abusive language while talking to their colleagues. All the hostellers should maintain dress code. All the hostellers should follow the time schedule provided to them in the hostel rules. No hostellers will leave the school premises without prior permission from their warden in writing and the same is to be submitted at the gate before leaving. All the hostellers are bound by the school rules given in the school almanac. All the hostellers are provided with a book shop and tailor shop for their daily needs which will be open during the timings fixed for the same. The notice board is provided in the hostel premises to apprise the hostellers for any notice forwarded to them. Dhobi will visiting the hostellers weekly and is allowed to collect a maximum of 20 clothes per week from the hostellers. The Barber will visit the hostellers once a week as fixed by the school authorities. All the hostellers will be taken to the Medical Officer for check-up treatment and follow up action once in a month with their responsibility of the hostellers. All visitors must carry the ‘Identity cards’ issued by the school and must first make an entry in the register at the Security cabin and provide all details and documents as requested by the Security personnel before entering the visitor’s area of the hostel complex. You will not be entertained by Security personnel, if you have not obtained prior permission for visiting hostel. All visitors must strictly adhere to the timings and leave the hostel complex as per the visiting hours given in item “a”. No one is allowed to give any food packet/s to security personnel for handing over to a boarder. Non-compliance of above shall lead to fines / penalty and / or expulsion from Hostel. An identity card will be issued to each hostel student and his/her guardian/parents no local guardian will be permitted to visit their wards without the identity card. Local; guardians may be turned away if they fail to produce the identify card. The school clinic functions throughout the day providing first-aid and immediate medical attention. The School Clinic is being run by Apollo Life. A qualified doctor and two nurses are on duty at all times during school hours. It also provides regular medical facilities to its staff and students and records are maintained. In case a child needs special medical attention and treatment, the parents are informed and child is handed over after seeking permission from the authorities. In case of emergency, the school ambulance transports the child to the hospital under supervision of School Doctor / Nurse. The switch off time hostel for students is 10.30 p.m. (VI to IX) 11.30 p.m. (X to XII).